Wow........ well after a week long journey and 3000 miles flown and sailed..I'm back. Seattle..gorgeous....Alaska...stunning. I have hundreds of pictures. Here are just a few. My favorite things were the Glaciers, the rain forests in Juneau that I didn't know existed and the colorful homes and totems of Ketchikan. and Ketchikan...the building in the picture houses it's only quilt shop. It was a wonderful quilt shop! It was a quilting cruise as well. I had a class with Margaret Miller who is known for her Angle Play. The class was a good learning experience about angles and design and really stepping up my quilting "game". In addition to that, I was encouraged to step up by Vikki Pignatelli who is know for Improvisational Quilting. Her ideas are just a tiny jumping off point. I could go crazy with her awesome ideas. I understand the process of improvisation and how to free my quilting mind...and embrace my creativity. It was a fabulous learning experience with Vikki. If you ever get the chance to learn from either teacher...DO it. I purchased a few items...not that much as I had to get it home on the suit case right!! We met sooo many wonderful quilters. 2 of my favorites were R and J. Well J wasn't a quilter really. She was a companion to R and her sister. We shopped on shore together and ate dinner every night in the dining room together. We had a great time talking, eating and talking MORE. It was just refreshing. I really needed a break from kids, work, Internet and cell phones. And I did certainly have one. I am happy to see my girls today and get back to business as usual. I used my time away to not only sew, but read a couple of novels(small ones) and design some new projects. Whew...that was a lot for one post. Thanks for checking in on me! We're going on a cruise to Alaska for our 10 year anniversary and it's a quilting cruise! 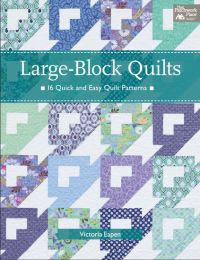 It's through QuiltCruises.com . My husband is THE best. I hope to relax there and have fun sewing again. There will be no computer access and I won't be blogging...I plan on spending this week getting ready. Then a week gone.....I am taking classes with Vikki Pignatelli and Margaret Miller. I hope they will inspire me again. I'll leave you with the block I made for our cruise challenge...I just didn't feel too inspired so it's basic. I have never made freezer jam before but I have heard it can be very very good and it's easy. It is suppose to make 5 - 8 oz. containers...guess what? It made WAY more...I just hope I didn't mess it up LOL. I had to run up to my sewing room and raid my Ball jars that I use for pincushions...wash them and use them...but it was fun. for those of you that commented on my weekend tutorial post. I am sorry to have had to remove the post. I will be re-posting a giveaway of Neptune charm pack in the future...I am deeply sorry for the confusion. I feel a bloggy break coming soon. 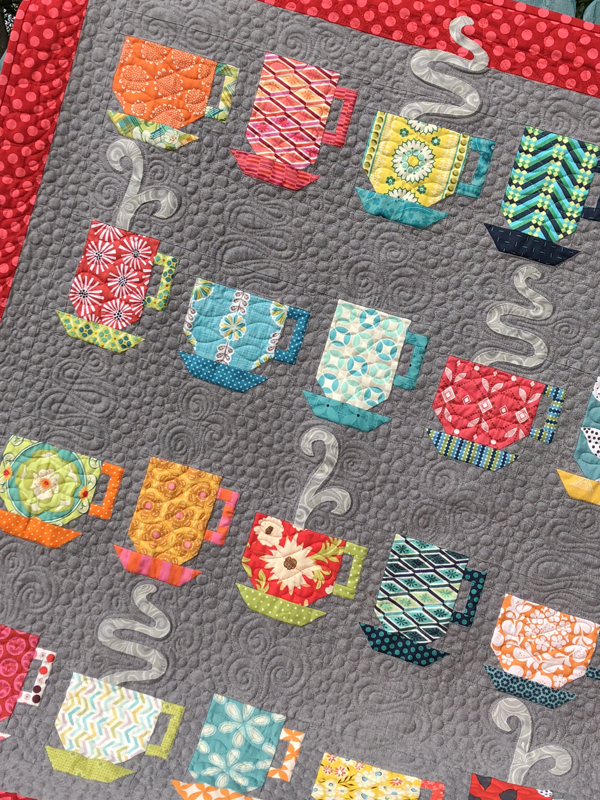 Camille and Carrie have brilliantly challenged each to show our first quilt and our latest quit. Here is my first quilt. I finished it in 1997. I used the pattern from Little Quilts All Through the House book. I made 3 or 4 of those quilts...I sold them or gave them away but I did keep my first. This is my recently finished quilt. Candy Buttons for Moda Bakeshop. I just LOVE this quilt. I can't get enough of it..the colors and the texture....but I love all my quilts. I've learned many many things in the last 12 years. Here's the top 3. 1. quality fabrics....sorry wally world you don't cut it. 2.use fabrics you love...that's right CUT your favorites..ALL of it. Things have been quite hectic for us on the home front. I had a BIG intentions of responding to each and every comment on my blog about the Candy Buttons quilt....but I think I only responded to maybe one. It's bad I know. I'd like to blame it on sewing..but that's not possible. I work 4 - 10 hours days..so that is part of it...the rest involves the house we are trying to sell. The buyers are being very difficult. It's the market. We expected some demands but this guy nearly wants us to build a new house! Like he wants a bathroom fan replaced because it's too noisy...well guess what? I DON'T want to be heard when I am going to the bathroom!! and aren't they usually kinda noisy anyway?? What ever...we have made them a final offer..and we are waiting to hear back. They may walk away from the deal... it's really in God's hands now. Now something on the bright side! Congrats..Jen..please send me your address at vleapen at yahoo dot com. Check out the scrapbooking giveaway on Rainy Day Kisses blog!!! 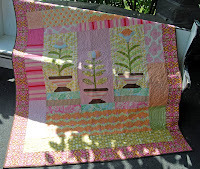 When I started to make this quilt I kept thinking about those sheets of sweet candy buttons I ate as a child. Sweet candies...I ♥ this quilt. 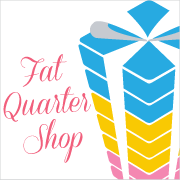 Although there seems to be an abundance of giveaways in blogland I am going to giveaway 1 set of Moda Sweet pre-cut circles for a lucky quilter that would like to make their own candy buttons quilt. 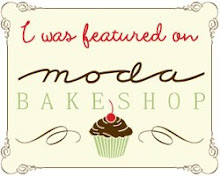 Leave a comment here to enter PLUS....Leave a comment on my post at Moda Bakeshop for a second entry!!! As suggested by BumbleBeans....I am going to giveaway a Clover yo-yo maker with the circles! One of my broccoli plants...growing very well this year. every year. I finally have a camera that will capture their beauty. So we'll spend the 4th home and enjoying what our small town has to offer. I may even swing over to the local quilt show today.